1935 Photo Shows Aftermath of Fire Truck and Streetcar Collision | Park View, D.C. I recently found this photo from 1935 that shows the aftermath of an accident between a fire engine and a street car in 1935. Below is the photo and the story behind it. 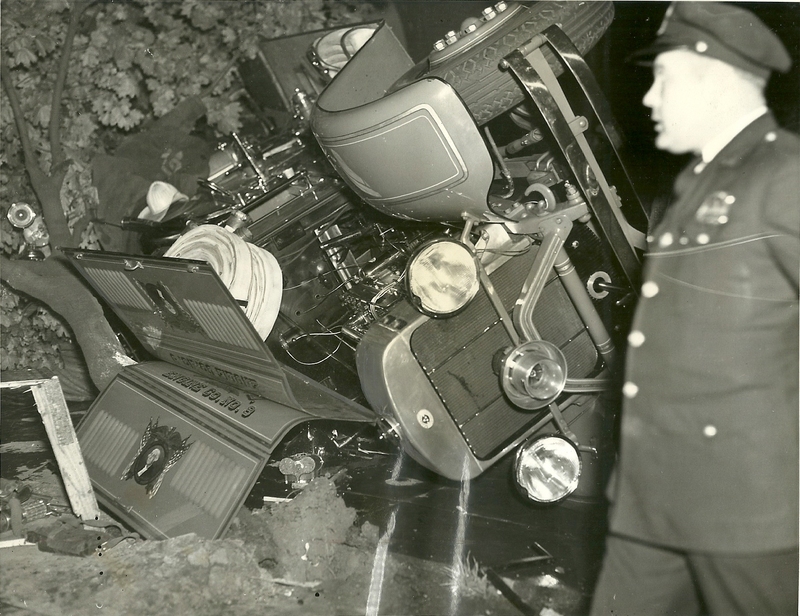 On the evening of May 8, 1935, an east bound fire engine responding to a fire was struck by a south bound street car at the intersection of 11 and V streets, NW. The engine was a combination hose and pumper that was on its way to extinguish a small fire in a bus, housed in a garage near Georgia Avenue and W Street, NW. The impact overturned the fire engine on the sidewalk and injured the four firemen on the truck, hurling one of them about 75 feet. The most severely injured was Private Raymond L. Creel, 30, of 413 D Street NE, who was taken to Garfield Hospital. The fire truck came to rest on the southeast corner of the intersection facing west. The front end of the street car was badly damaged, but the motorman and the few passengers escaped injury. At the time of the accident, there was little traffic and the way had appeared clear for the fire engine. Charges were brought against the motorman of the Capital Transit Co. streetcar for failing to give the right of way to the fire truck. A report into the accident determined that the fire siren was being operated and could be heard blocks away and that the street car was being operated at an excessive rate of speed when approaching a street intersection while fire apparatus sirens were sounding. By the end of June, all the firemen, although badly injured, were reported to have recovered or to be recovering. _____. “Fire Engine’s Crash Blamed on Motorman.” The Washington Post, June 21, 1935, p. 11. _____. “Four Appointed to Probe Crash of Fire Engine.” The Washington Post, May 10, 1935, p. 18. _____. “Motorman Arraigned for Fire Truck Crash.” The Washington Post, May 24, 1935, p. 18. _____. “Motorman’s Case Delayed to June 11.” The Evening Star, May 23, 1935, p. B-1. _____. “Motorman Held at Fault in Crash.” The Evening Star, June 20, 1935, p. B-1. _____. “Probe is Ordered After Fire Engine Crash; Four Hurt.” The Evening Star, May 9, 1935, p. B-1. _____. “Street Car and Fire Engine.” The Evening Star, May 9, 1935, p. A-10. _____. “Trolley-Engine Collision Story Told in Court.” The Washington Post, June 26, 1935, p. 4. _____. “Trolley Hits Fire Engine; Four Inured [sic].” The Washington Post, May 9, 1935, p. 1. This entry was posted on February 9, 2016 at 7:01 am and is filed under DCFD, History. You can subscribe via RSS 2.0 feed to this post's comments.